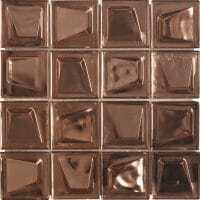 Add an element of luxury to your home with our beautiful range of metal and metallic mosaic tiles. 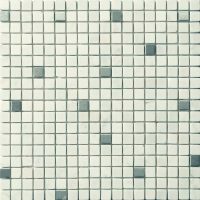 You can find glass mosaic tiles with metal features that create a fantastic studded effect, ideal for an ultra-sleek modern look. Benefit from multi textured tiles offering both polished and brushed surfaces, creating a stunning mix of matt and shiny colours, ideal for anyone who loves a luxurious finish. 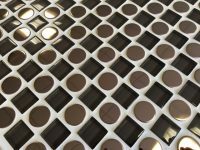 Metal inserts add depth and texture to the tiles so take a look at our range now, to find designs, sizes and styles to suit your taste. 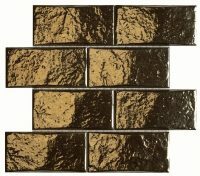 Metal and metallic mosaic tiles are a long-standing trend in interior design which are used to enhance beauty and glamour in any home — and their popularity has no indication of dying down any time soon! Available in a wide array of stunning designs, these metallic wall and floor choices effortlessly exude luxury wherever they’re used. Whether you want an opulent bathroom, a sophisticated and contemporary kitchen, or a stunning conservatory, these tiles are versatile enough to transform any room you want. 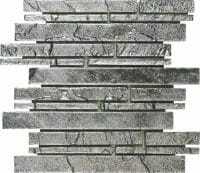 Are you considering updating your home with our beautiful, contemporary metal and steel look mosaics? And are you looking for ideas on how to make the most of these tile options in your home? Read on! The following article will suggest a few ways how you can use these tiles for best results, as well as the decor, furniture, and accessories they work best with. If you’re looking to update your bathroom, why not be bold? 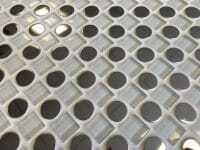 Metal and metallic mosaic tiles on the floor or walls — or both — will breathe life back into the room. Available in a number of stunning designs, these attractive tiles can turn your bathroom into the luxurious modern haven you’ve been dreaming of. Of course, tiles are also water-resistant and super easy to clean — so they’re really ideal for decorating bathrooms! You may be wary of opting for darker colours in your bathroom, but don’t be! 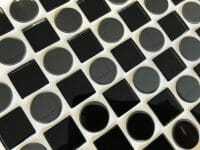 The bathroom is the perfect place for metal and metallic mosaic tiles in bolder shades such as black and grey. Why? Because these colours bring a sense of opulence and glamour to the room like nothing else can. If you want a sleek, sophisticated look to your bathroom — which is just as equally warm and inviting — metal and metallic mosaic tiles are an obvious choice! If wall-to-wall coverage is too much for your tastes, you can choose to tile only one specific wall and make it the star feature of your bathroom. You can also focus on tiling just the splashback areas around your bath, sink, and shower — this will give the room a simple yet impactful update. Alternatively, you can use metal and metallic mosaic tiles on the floor to create a truly striking space. Better yet, these gorgeous tiles work to reflect the light. Your bathroom will therefore benefit from a beautiful shimmer and an enhanced sense of space. Once you have your beautiful metal and metallic mosaic tiles in place, you can choose to keep the rest of your bathroom dark and moody to continue the theme. Having a black sink and bath will create an ultra-dramatic look. However, opting for light, white furniture will create a stunning contrast with your tiles. Getting the lighting right is key — don’t rely on just one light source for the whole room. Layer the light — or install a handy dimmer switch — to provide a warm, luxurious ambience. Use a combination of spotlights, sconces, and a pendant light and the metallic tiles will help bounce the light around. Nothing gives a warm welcome like a beautifully decorated entry hall. 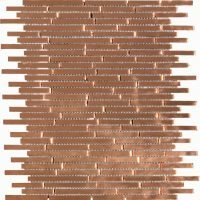 And metal and metallic mosaic tiles will truly give your entry hall the wow-factor! Not only do these stunning tiles give a great first impression, they’re also water- and stain-resistant. You’ll be so glad you used them in this highly-trafficked area. 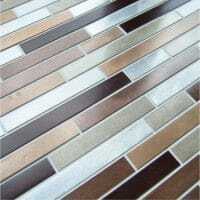 The main benefit of using glossy tiles in your entry hall is how they reflect the light. Using metal and metallic mosaic tiles on either the floor or walls will keep your hallway bright and delightfully shimmery as they function to uplift the space even on the dullest days. Whichever colour and style of tiles you choose for your entry hall, they will naturally stand out as the main feature of the room. As for further decoration in this area, keep things simple! There’s no need to overwhelm the your entry hall with too many items of furniture and accessories. Every entry hall benefits from a large mirror to reflect the light; one with a gold frame will contrast beautifully with the tiles. Mirrors also help enhance the light-reflecting qualities of the tiles even further. The end result will be a bigger and brighter room. Add in a sleek console table — ideal for hiding away clutter and loose odds and ends — and you’re all set. Your conservatory is a special room in your home. It’s an extra room you can make use of for dining, entertaining guests, or simply relaxing on a comfy chair as you gaze out onto your green garden. It certainly deserves just as much TLC as the rest of your home! Decorating with metal and metallic mosaic tiles on the floor or walls of your conservatory is a sure-fire way to instantly create a stylish impact. These chic tiles not only look beautiful, but they also reflect the light and increase the overall sense of space in the room. Since your conservatory gets a lot of natural light, metal and metallic mosaic tiles are an ideal choice for this area. Which colour of tile should you go for? Brown or copper shades are good for adding warmth and introducing a cosy vibe in your conservatory. Silver metallic tiles are a sleek choice, which also help make the room look bigger and lighter. Alternatively, a black and white checker design on the floor is a timeless option; this design is stunning and adds another interesting dimension to the room. When it comes to adding furniture and accessories to the room, go for lighter shades. White colours in particular will contrast nicely with the tiles. Keep the room well-lit with multiple sources of light, so you can continue to enjoy your metallic tiles well into the evening hours. Bring the outdoors inside by adding some green or flowering plants to your conservatory; this will give the room a fresh feel and complete the look. Sure, kitchens have to be utilitarian, but that doesn’t mean they have to be lacking in style. Decorating your kitchen with metal and metallic mosaic tiles is an easy way to add sophistication and beauty to the room. While these glossy tiles are modern in style, they also incorporate warmth typically associated with traditional design. 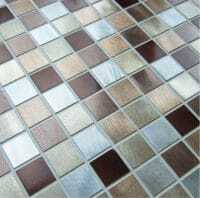 Metal and metallic mosaic tiles can therefore truly give you the best of both worlds. When it comes to using metal and metallic mosaics in your kitchen, you can cover either the wall or floors — both will look great! These tiles are also water- and stain-resistant, so you’ll find them really easy to keep clean. Another popular idea is to use the tiles to create a unique wall splashback that’s both functional and beautiful. If you have a fireplace in your kitchen — or anywhere in your house– you can also frame it with metallic tiles. This is an easy way to create an eye-catching feature in your home without having to go to a lot of effort or expense. If you decide to use these tiles on the walls or as a backsplash in your kitchen, you can create a stunning contrast in colour by using lighter flooring and countertops. The aluminum look metallics will also look good with silver or chrome taps, stainless steel fixtures, and copper light fittings. Keep your kitchen as neat and as tidy as possible to help it stay looking sleek and polished — a clutter-free area will better show off your backsplashes without them looking gray and dull. There you have it: a selection of stunning ways you can use metal and metallic mosaic tiles in your own home. Whether you choose to use them in your kitchen, bathroom, entry hall, or conservatory — or another room of your house — these beautiful tiles will enhance any space tenfold. 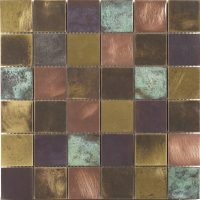 Use metal and metallic mosaic tiles to create the gorgeous, luxurious home you deserve! Our showroom and shop have a variety of different choices available from each manufacturer and factory that we work with. We also store a quality collection of products in ceramic, porcelain, stone – like slate, marble, limestone and available. Prices and offers should be displayed throughout, including with the delivery details and the ability to buy samples.